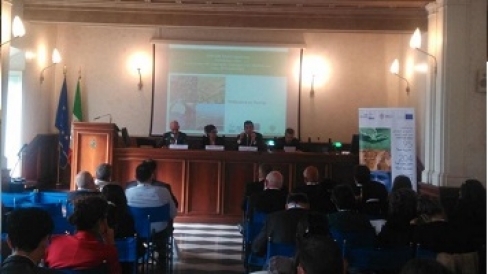 MED-DESIRE project was among 38 environmental sustainability projects funded under the ENPI CBC MED Programme 2007-2013 that participated in the capitalization event “Environmental and Sustainability Challenges in the Mediterranean Area” that was held in Rome on 28 October 2015. The main results achieved by the projects financed under the programme were discussed and analyzed in the event, specifically aiming at the identification of complementarities, synergies, good practices and common valuable approaches. It is within this spirit that the organizers selected MED-DESIRE project to present the scope, coverage and expected impacts of local and international agreements signed or to be signed within the framework of 9 ENPI CBC Med projects of the renewable energies and energy efficiency cluster. The presentation was given by Rani Al Achkar, MED-DESIRE project coordinator on behalf of the Lebanese Center for Energy Conservation. The presentation introduced the project and its objectives, the key agreements, collaborations and achievement of the project at the international, national and local levels. It also included the agreements and collaborations achieved within other ENPI CBC Med projects in Lebanon within the renewable energies and energy efficiency cluster, thus highlighting the synergies and continuous coordination of the efforts by the project partner in the country. d. Establishment of an accredited testing lab for PV qualifying. ii. NREA-AAE (to be signed) on the exchange of know-how and joint research activities. i. MEW-MEHE Lebanon for the adoption of specific training modules/curricula at academic level. iii. LCEC-UoM of Tyre on solar ordinances design and implementation. The event was a great opportunity to showcase the achievements of the project and capitalize on the results in order to push forward the evolution of the renewable energies and energy efficiency sector in the Mediterranean region.